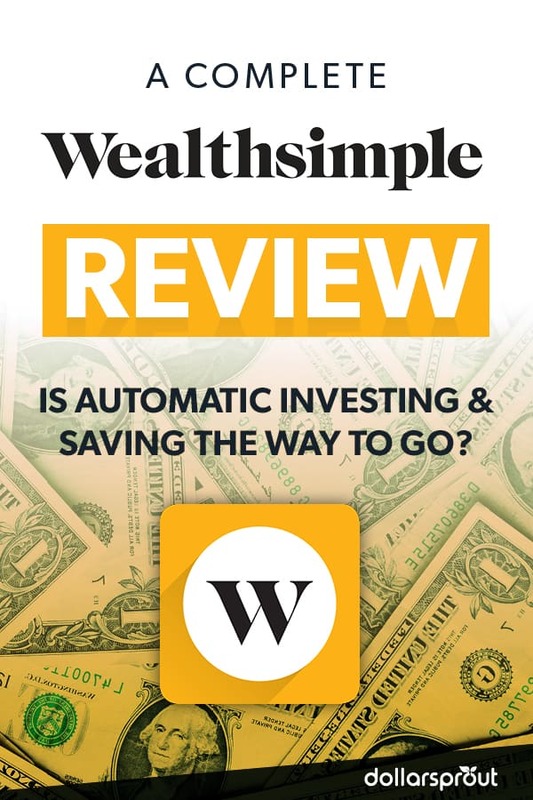 In this review of Wealthsimple, we cover the investing and saving services offered by the company to help you decide whether they’re the right choice for you. When it comes to saving and investing, there’s more to it than just setting aside money in a savings account. First, you need to make a budget and include some extra money for savings. Then you have to stick to the budget and avoid overspending. Once you’ve actually saved the money, you need to decide how to invest it. With the huge variety of investment options available — stocks, bonds, mutual funds, ETFs, futures, options, certificates of deposit, and more — it’s easy to see why investing is a daunting task for many people. Wealthsimple uses automation to make investing easy. You tell them your goals, they handle the rest. What is Wealthsimple and How Does it Work? Every company has its benefits and drawbacks, and Wealthsimple is no different. This review will cover some of the tool’s pros and cons and tell you everything you need to know about investing with the company. Best for: Wealthsimple is a good choice for people who want an easy, automated investing solution with an attached savings account. The personalization options, like building a socially responsible portfolio, are a nice perk. However, you should look at the competition, as many other robo-advisors charge lower fees for similar service. Wealthsimple is a brokerage company that offers automatic investing services. Unlike traditional brokerage accounts where you’re responsible for building and managing your portfolio, Wealthsimple’s draw is that its program does everything for you — from building your portfolio to making sure your asset allocation remains the same over time. With low minimum investment requirements and an easy to use investment tool, it stays true to its origins. If you ever want a more human touch to help with your robo-advisor-built portfolio, you can speak with one of Wealthsimple’s financial advisors. Getting started with Wealthsimple is, suitably, pretty simple. Sign up for an account online, enter your information, and Wealthsimple will build your personalized portfolio in a matter of minutes. When you first sign up for your account, Wealthsimple will ask you to answer a few questions about yourself. You’ll have to choose which type of account to open and answer some questions about your goals and risk tolerance. Once you answer a few basic questions, it will present you with a personalized portfolio. You can go with Wealthsimple’s suggestions or make changes as you feel necessary. Wealthsimple’s portfolios are built using a variety of Exchange Traded Funds (ETFs). ETFs are a lot like mutual funds. Each ETF owns shares in a wide variety of stocks, bonds, and other securities. Therefore, buying a share in one ETF is like buying shares in hundreds of securities. By spreading your money among multiple ETFs, Wealthfront diversifies your investments across the entire market. The amount of money allocated to each ETF depends on your risk tolerance and goals. If you want to customize your investing strategy, you have the option to do so. For example, you can opt for a socially responsible portfolio that focuses on companies that stay green, support local initiatives, and promote gender diversity among their leadership. If you want to take the automation one step further, you can set up recurring deposits to your investment account. Wealthsimple also offers a tool called RoundUp. You can start by linking your debit or credit card and activating RoundUp through Wealthsimple’s website or app. Every time you make a purchase, RoundUp will round the cost of your purchase up to the next dollar. The additional funds will automatically transfer to your Wealthsimple account. After that, the robo-advisory software takes over, automatically allocating the money across your investment portfolio. Wealthsimple has no account minimums, but it does offer perks to customers with large balances. If you invest $100,000 through Wealthsimple, you qualify for Wealthsimple Black, which includes lower fees, a personal money coach who can help you meet your goals, and access to more than 1,000 airport lounges around the globe. Wealthsimple offers an array of account options. You can open a basic taxable account to save alongside your other investment accounts. Add and withdraw money whenever you’d like, penalty-free. If you want to share the account with a spouse or partner, you also have the option to open a joint account. Other options include a Traditional, Roth, or SEP IRA. These accounts offer tax benefits. However, they come with investment limits and withdrawal rules that you need to pay attention to. Despite what its name implies, Wealthsimple Save is not a traditional savings account. Instead, it functions more like a money market fund. Unlike your Wealthsimple Invest account, the money in your Wealthsimple Save account will be exposed to very little risk and will earn a consistent rate of return. You can withdraw money as often as you’d like. There are no minimum balances and no low balance fees to worry about. With any investment service, robo-advisors in particular, you have to pay attention to costs. Robo-advisors don’t offer their services for free. This charge is somewhat higher than Wealthsimple’s competitors, so it’s worth doing some comparison shopping to make sure that the additional cost is worth it. Let’s look at some of the most common questions people have about Wealthsimple. How do I take money out of my Wealthsimple account? You can withdraw money from Wealthsimple at any time. All you have to do is log in to your account, click on the “withdrawals” tab, and enter the amount you’d like to withdraw from the account. One thing to consider when making a withdrawal is taxes. To withdraw money, you’ll have to sell some investments, and selling investments can incur a capital gains tax if those investments have increased in value. If that’s the case, you’ll owe taxes on your gains at the end of the year. Make sure you set aside enough to cover your tax bill. Can you lose money on Wealthsimple? Yes. Investing through Wealthsimple, like any other investment company, is subject to risk. If the value of your investments decrease and you sell the investments, you will lose money. The idea behind Wealthsimple is that diversifying your investments across the market can help reduce the risk of losses, especially over the long term. In theory, this diversification reduces risk. However, there is always the chance that you can lose money by investing, no matter how diversified your portfolio is. Does Wealthsimple offer specialized portfolios? Yes, Wealthsimple offers a variety of portfolios that you can use to cater your investments to your personal beliefs or goals. For example, Wealthsimple offers the option of Halal investing, which complies with Islamic law. Investments that involve profiting off of debt are prohibited. This portfolio includes 50 stocks that were specially selected to meet this requirement while accurately tracking the market. The platform also offers socially conscious portfolios, allowing you to focus on green companies, companies that promote gender diversity, or other social causes that are important to you. Wealthsimple is a powerful robo-advisory service that helps you automate both saving and investing. It also allows you to customize your portfolio and offers options that support your beliefs and values while still working toward your goals. The biggest downside is that Wealthsimple charges slightly higher fees than other robo-advisors. If you’re considering working with a robo-advisor, take the time to comparison shop so you can feel confident that you’re getting a good deal.